One of Constantia's finest daily breakfast, lunch and dinner venues! Situated in the glorious Constantia valley in Cape Town, alongside the historic Cellars building at the Cellars-Hohenhort, The Conservatory is Cape Town’s premier stylish Restaurant. 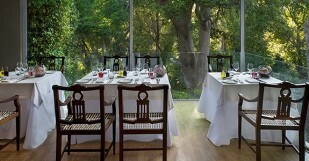 Set around a giant 300-year-old oak tree, The Conservatory is at once an idyllic dining venue. Dining options include the airy indoors or the sun-drenched terrace. The Head Chef prepares hotel classics and exciting new dishes prepared with the best of local produce. The service is friendly without being intrusive. Peter's philosophy to food preparation proudly boasts that "If it is not the best it can be, it doesn't belong on the menu!" This is the attitude that entrenches Peter’s reputation and earned him several awards and accolades. The six restaurants of the Liz McGrath's Collection fall under Peter’s auspices be it the sophisticated gastronomic Greenhouse, or the earthy Seafood restaurant at The Marine, the gold standard set simply is perfection. 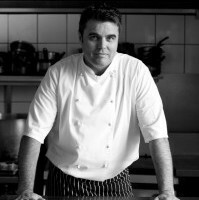 Peter's style has been influenced by culinary masters like Marco Pierre-White, Giorgio Locatelli, Joel Robuchon, Anne-Sophie Pic, and Daniel Humm. The Greenhouse is the flagship restaurant where contemporary cuisine blends with rich South African ingredients and flavours. The Greenhouse is regarded as one of the leading restaurants in South Africa and is consciously aware of ecological concerns without compromising on dining taste and enjoyment creating exciting dishes sometimes from less glamorous fish and seafood unique to The Greenhouse and The Collection by Liz McGrath. Menus are samples only and subject to change, for today’s menu please contact the restaurant directly. Bring the whole family and celebrate Easter on Sunday 21 April at the Conservatory. Our culinary team will present a delicious Family Easter Feast and the kids can enjoy a fun filled Easter Egg hunt in our garden and magical forest. The guided garden tours take place every Wednesday at 10h30. Guests will be in the capable hands of our garden manager. When the tour concludes, guests can enjoy tea and freshly baked scones outside in the picturesque garden setting or on the hotel’s Conservatory terrace. Spend quality time with friends and family, whilst enjoying a traditional Sunday Roast for just R155 per person.